Yes, I did it! I chose mobility above Power and Style! Those of you that follow me might know about my predicament in a post I wrote some time ago complaining to Microsoft about SurfacePRO on battery life. I was conflicted whether to get the SurfacePro or not. Believe you me, there is nothing I wouldn’t give to get SurfacePro, its got the muscle, its got the style, but the only thing it hasn’t got is the stamina; which I desperately need. In the post I complained I already have a Core i5 tablet giving me an average of 3 hours, I was not ready to get another Core i5 tablet giving me an average of 4 to 5 hours. I need the stamina, to be able to leave the power adapter for once at home! You could have said why not get the SurfaceRT that was pushing 9hrs of use, well, just one reason, I’m not just an Internet buff trolling the net all day, I’ve got some real work to do in my daily life. I need to be able to access my office and do real work on my Tablet, and I mean real work. VPN, Office, Citrix and Proprietary apps; you know, the real deal. SurfaceRT will not cut it for me. And if SurfaceRT will not cut it, iPad and Android devices could never. I am of the opinion, you stick to the platform that most serve your need. There’s no way to get me to actively use Google’s products. I only use YouTube passively, period. Apple’s walled-garden is too limiting for me, so thank you, I’ll stay on MS campus if you don’t mind. So, the decision is quickly made, Atom tablet it is! Current x86 Clovertrail tablets are pushing average of 9hrs of use, the only thing is the bad press they are getting. Nearly all of the reviewers were complaining about near uselessness of these tabs. Could they be right? As of this moment, I can tell you for fact, the majority CAN be wrong, and they ARE wrong! I went to the local Mall to check out the Atom tablets available for myself. There are many of them, but the one that got me is the ASUS Vivotab Smart. Dang! That device is small, thin and light! The ultimate mobility candidate! And it could give me 9+ hours? Well, I loved the size and its feature, but I was put off by its screen quality. It has just an IPS screen, a cheaper screen compared to others with Super-IPS screens. And what’s more it’s a bit greenish and washed out. It was the worst screen you could have! Another thing is I could not for the life of me bring up the Charm on this thing, can’t open app bars, it seems this only Show unit was broken. Asked an attendant why the Charm is not working, he said he didn’t know why, and from his demeanor, I could see he didn’t care neither. This is exactly the reason why Microsoft needs to open motar&brick shops himself, there are just too much MS-hating shop attendants out there! Well, the geek in me did what’s right at that point in time; I reloaded Windows 8 there and then! Have you ever did a complete restore of an OS in a shopping mall?! Thanks to that single action, my opinion of the device changed. The device came back restored to its default state. Some idiots obviously were messing around with the tab, probably disabled the Windows 8 gestures in the registry, sabotaging the product. There are too many haters out there I tell you. Well, the device is looking good now, and very responsive. WEI (windows experience index) is 3.2, that’s not bad for a device that all reviewers were dumping upon. And from what I can see, there is nothing wrong with the response. The only thing still is the white balance, still tends to the green. Tried to set the color correction to reduce green or bring up blue and red, to my dismay, you can’t do Windows color correction on this device. I was furious with Microsoft. 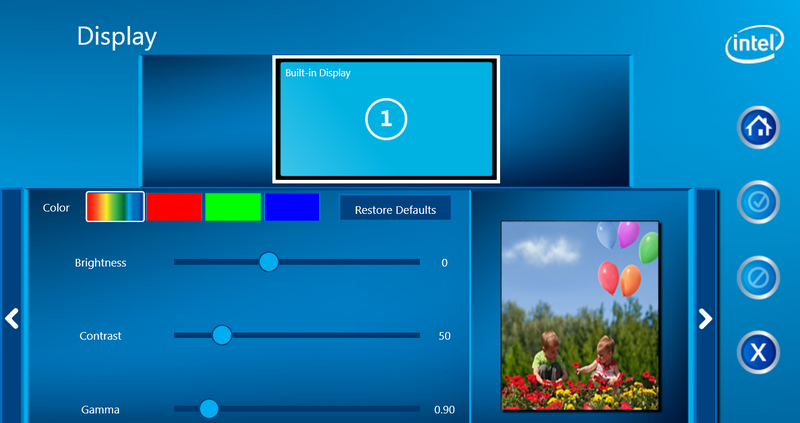 Why in everything holy would they disable color correction in the Display Wizard?! Tweeted about this, bought the device and left the shop. Guys, it was the best decision I’ve ever made. Don’t listen to idiots when it comes to your devices. Go out there and try it, or order it online and give it a spin yourself, you can always return it if it doesn’t meet your requirement. I tell you, this atom device is perfect. It withstood everything I threw at it up till now. Got the Task Manager permanently fixed on the taskbar watching CPU usage, I’ve never seen such a cool device, and literarily cool too, no heat, no fan. It’s a dream. What’s more, this thing is powered via a standard micro-usb! I don’t have to lug a bulky power adaptor around, I could just charge with the same charger as my Lumia 920! Are you kidding me?! I mean, we all have this notion in our heads, when you mention an Intel device, you automatically see a bulky power adaptor next to it. I am looking at your HP and Dell! That “Since OS install” is just a fair estimation. I am definitely getting more than 10 hours on this thing. Its an eye-opener for someone that is used to meager battery life on my laptops and tablets. So there you go. The last argument against Intel platform for mobility thrown out of the window. At the moment Intel Atom Clovertrail CPU leave ARM in the dust in terms of performance. And now that Intel can match and exceed ARM battery life, the contest is over as far as I am concerned. I don’t care what the fanboys sing. On lesson is very clear from this experience, don’t listen to Apple or Android-invested sites to tell you about a competing platform. Go out there an test for yourself. Go to GDGT and see the ridicule of it all. Where real users are giving products 9 or 10 and reviewers are giving 6 or 7. I tell you most of these fanboys have lost their credibility. I am mad that they are still being called journalists. There’s nothing journalistic about what they do. They don’t report facts, they only try to shape opinions. When I was getting this device, my mindset was to get a less-than-average device to get me to the Intel Haswell timeframe when I hope MS will release a Haswell Surface product that combine beauty and brawn, with stamina to boot. 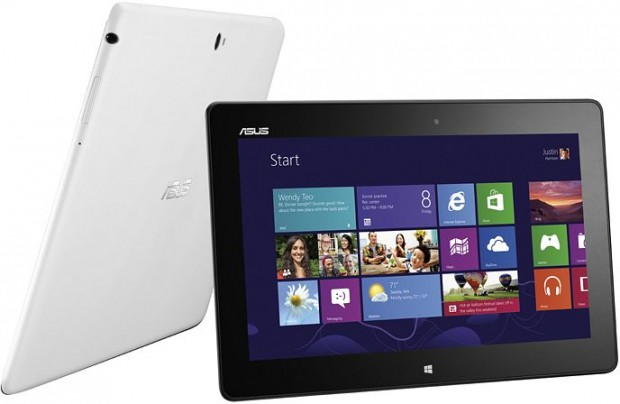 But I can tell you I am more than satisfied with this ASUS Vivotab Smart tablet. Its my companion device now. No, I don’t play Crysis on the device, I don’t have ridiculous expectation of an Atom device like the most reviewers do. They should stop comparing apples with oranges. Atom Clovertrail was never meant to compete with Ultrabook class devices, it was meant to compete with ARM devices, and that is where it is leaving the types of iPads and Galaxy Notes and Nexus is the dust. If you’ve been holding back on getting Atom x86 tablets because of what you’ve been reading, don’t wait any longer, they are perfect Work and Play devices! Well, remember I said, I just wanted an interim device to get me through to the Haswell timeframe. I wasn’t ready to spend too much on this interim device as my goal is towards a more comprehensive solution obtained by a Haswell Surface device. So this ASUS Vivo Tab Smart hit just the sweet spot of functionality and price for such an interim device. I will miss my active, Wacom-based digitizer pen, I think I can bear till the end of year without it. Nothing really beats a 10Hrs device with 64Gb, so light and mobile. I am really happy with the device. Best windows 8 tablet on the market is HP Elite Pad 900, hardware build quality is as good as iPad comparing look, performance, finish, weight, thickness, made with milled aluminum and gorilla 2 glass. Additional goodies like expandable jacket, pen support. Unfortunately HP markets this tablet as a business tablet so you can buy from only few online retailers or by phone only. Lenovo ThinkPad 2 is a good windows 8 tablet but not made of aluminum and doesn’t look as sleek as HP Elitepad or HP Envy X2. HP Envy x2 is good as well but 11.6″ is little bigger for me to use as a tablet. There are many other Windows 8 tablets on the market but some of them may have either build quality issues or WiFi issues or sound quality issues unless you always carry a headphone with you. @Tom Grissom: Well written user experience. Many Techno-blogger forget the fact that there are industrial branches where Pen Computer shines, like for Medical and Education Institutions. How many Artist do you know that paint with fingers only? I am amazed by how many bloggers think an average Joe just sit whole day and surf the Internet like they do. There are some of us that really work for the money, and the no-compromise solution given by Windows 8 is underestimated by them. Hi! 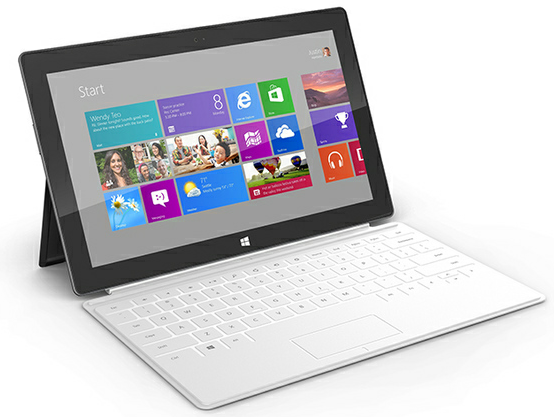 I’m searching for a “budget” win 8 pro tablet for the exact same reasons and needs. Besides needing it for some light work and win apps, I’m also a casual gamer. Can you tell me if it’s capable of running Steam client? I’m not expecting to play FPS, or Civ V, or other 3D demanding games, but i’d really like to know beforehand if it was possible to play some not-so-heavy games, like platformers or DotP 2013, on Vivo Smart. Unfortunately I dont play games, so I cant say how Steam Engine will perform for casual gaming. I’ll try find out and let you know. Thanks McAkins, looking forward to know!